34 Comments	This post may contain affiliate links. 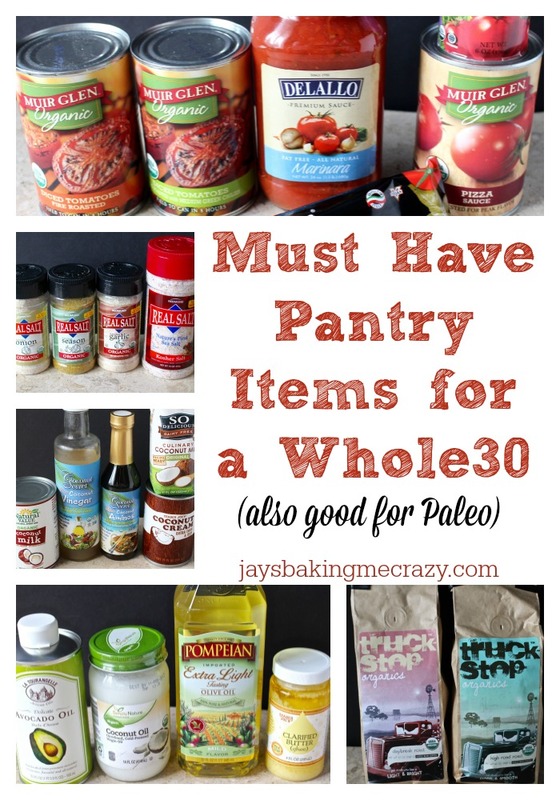 These are my must have pantry items for a Whole30. It will help you be more prepared and eat more flavorful food. Doing a Whole30 can be tough because as a society we have been taught to rely on ready made food and even been told it’s healthy. It can feel intimidating not knowing what to buy. I mean, obviously veggies, fruit, organic chicken and grass-fed beef are main staples, but what about pantry items? I want to show you what I kept stocked that made our Whole30 feel easy and not expensive! 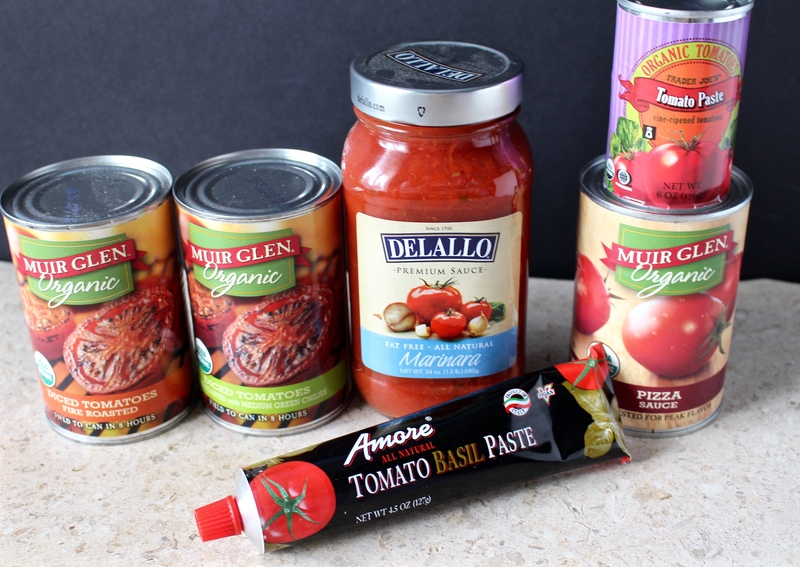 Some of these items can be found at Aldi and a lot can be found at Trader Joes- both places with great prices. Eating real food is possible! Another resource I’ve found lately is Thrive Market. They make eating healthy easy because they have a huge selection of items and they can be delivered to your doorstep. How great is that!?! That is the only place I buy my coconut aminos and vinegar because it is more than $2 a bottle cheaper. That adds up fast the way we go through those bottles. Also, shipping is free over $49 so stock up all at once. They also have an option where you can shop everything paleo (it is not all Whole30) which makes it super easy and is a great way to find out about new products. Here is the link to their site and you’ll get 20% off your first 3 orders with it- Thrive Market. You will love it!! Organic Unrefined Coconut Oil- I cook eggs with this, put it in coffee, and it is basically my go-to for sautéing. It does have a slight coconut-y flavor, but it’s not bad. My husband who doesn’t like coconut, loves coconut oil. 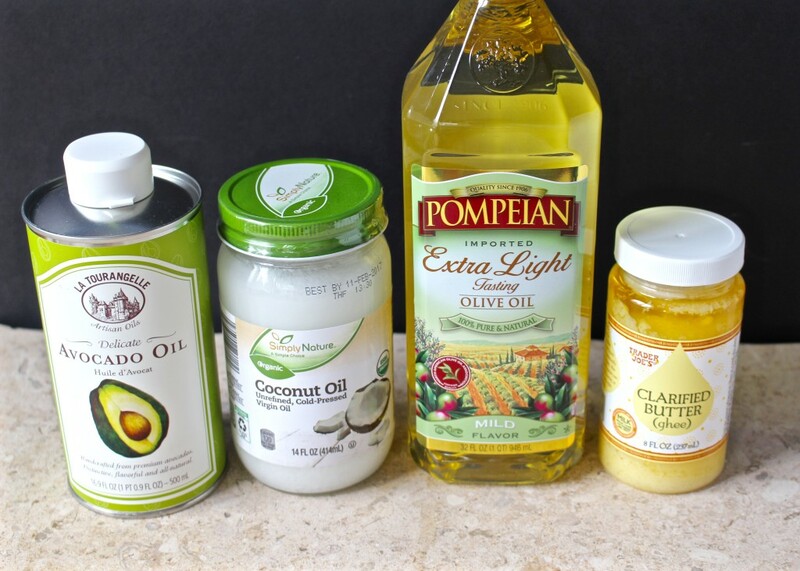 Avocado Oil– I almost always use this to roast veggies. It’s very mild flavor makes the seasonings stand out. It makes the BEST Baked Fries! Olive Oil- I only use this for Mayo and Caesar – it has a very mild flavor which is great for making dressings. Ghee– I use this in my Lemon Butter Chicken, Buffalo Wings, and Mashed Cauliflower, but also on cooked veggies where butter would normally be used. 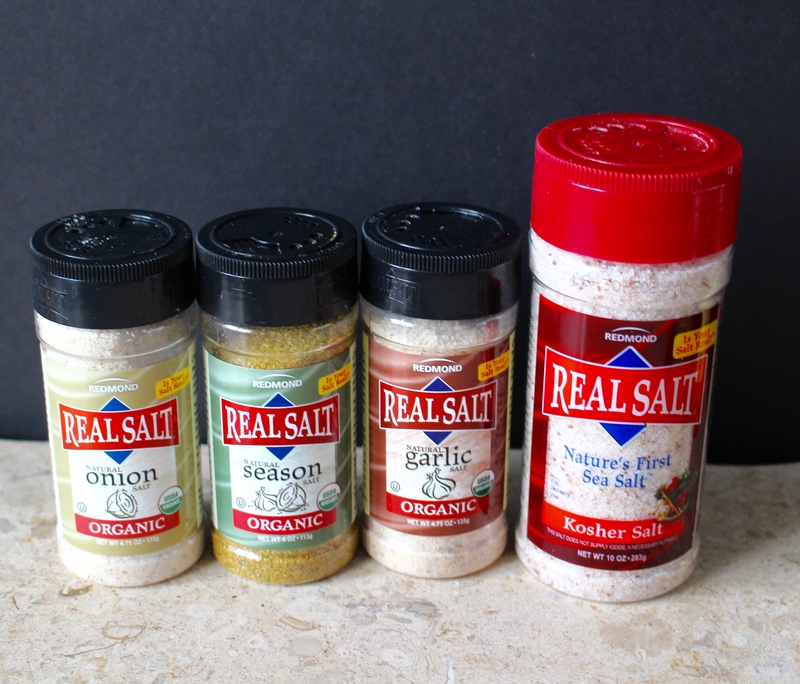 Real Salt is by far my favorite salt and seasoning. Personally, I like the course ground, but they also have a finer ground as well. That season salt is AMAZING on potato fries. It’s basically my husband’s favorite side dish ever! It has no weird ingredients or MSG (like many main brands) and the flavor is incredible. I just started using their onion and garlic salt and they are so good and taste fresher than other brands I’ve tried. I’m not getting paid to say this, I just really love them! That season salt is the secret to my Paleo Baked Fries. 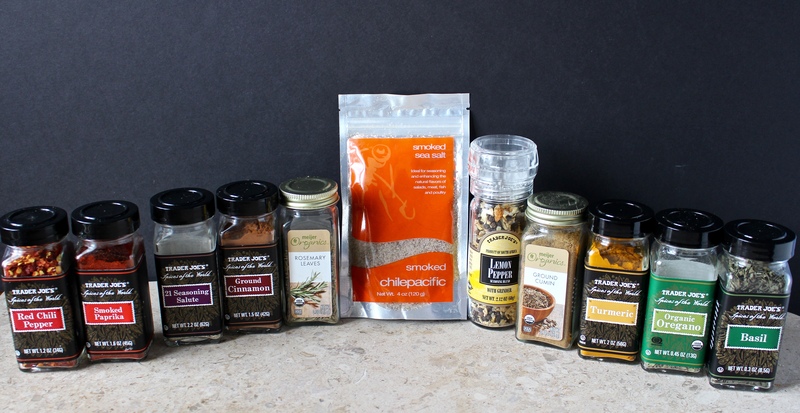 These are all the other seasonings I use. I do believe fresh is always best, but I understand that isn’t always an option. 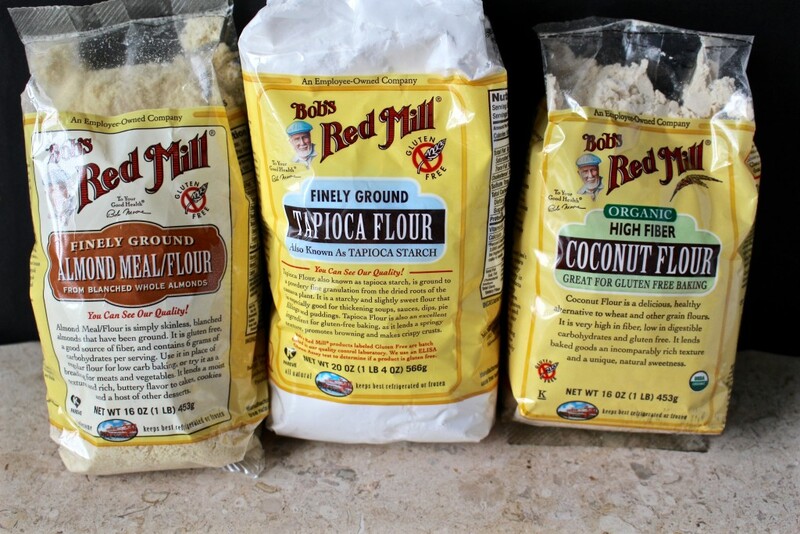 One ingredient seasonings are great, but watch for anti-caking agents. Here I have Red Chili Pepper, Smoked Paprika, 21 Seasoning Salute (a mix of all real spices), ground cinnamon (great on sweet potato and mixed in almond butter), Rosemary, Smoked Sea Salt (gives an amazing smokey flavor when you’re not able to grill. Also good in my Barbecue Sauce and Tuna Salad), TJ’s Lemon Pepper (be careful of other brands), ground cumin, turmeric, oregano, and basil. There may be others, but this is all I could find in my cupboard. Yes, they get a whole category because I always have a few types in my pantry. Fire Roasted are my favorite- they add a deeper flavor to the dish you’re making. Here a a couple recipes where I use them: Paleo Ketchup and Barbecue Sauce. Tomato paste is awesome. I use the regular one in dishes that need a boost of tomato flavor and the basil one on baked chicken thighs. I use it in my Shepherd’s Pie. Pizza Sauce- no, you can’t make pizza with this, but you can use it in the Pizza Quiche, Pizza Chicken, Pizza Potato Skins and Pizza Soup! That marinara is great for last minute quick dinners. This can be a tricky item to find without added sugar or cheap oil, but Dellalo has a few good ones (read the label) and there is even an organic one at Aldi that is compliant for just over a dollar. That’s a great deal considering I’ve seen jars for over $10 at Whole Foods. I use this in my Baked Spaghetti. Coconut Aminos– by far my most used ingredient. I go through so many bottles of this because it is so good. I use it in so many dishes like my Sloppy Joes, Paleo Meatloaf, Barbecue Beef and Bacon, Carnitas and Thai Chicken, but I also use it to sauté veggies or add flavor to ground beef. Here is where I buy it. 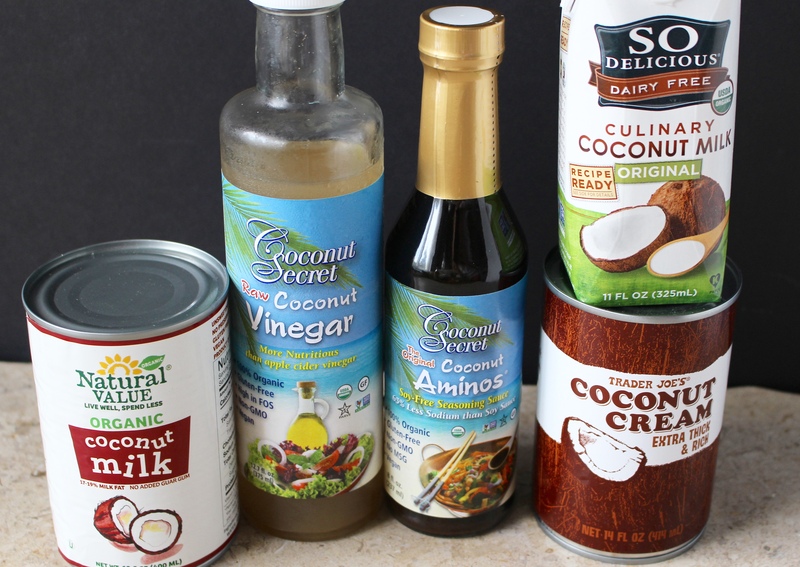 Coconut Vinegar– this is another highly used item. I use it in my Ketchup and Barbecue Sauce and bone broth. Here is where I buy it. Coconut Cream– this stuff is super thick and a great replacement for wherever you might have used sour cream of yogurt. I use it to make Ranch Dressing, Salisbury Steak, and Tzatziki Sauce. Coconut Milk– this is thinner than coconut cream and is great in soups. That re-closeable one is nice for when you just need a little bit. That’s what I used in the Breakfast Pizza Quiche. 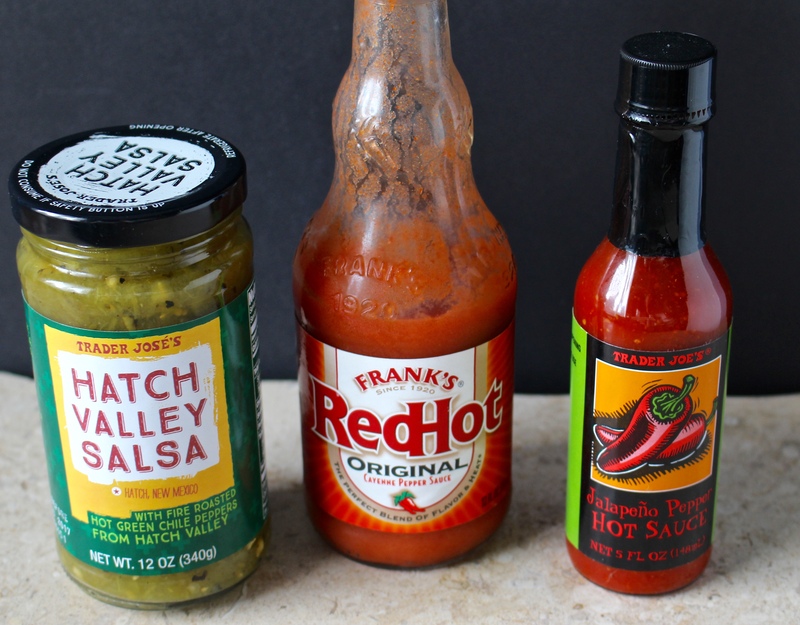 Hatch Valley Salsa- this isn’t the only approved salsa from Trader Joe’s, it’s just my personal favorite. 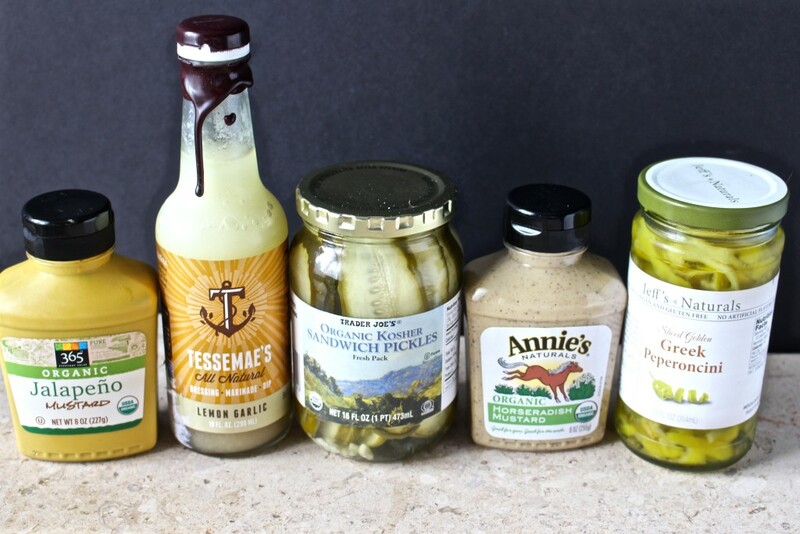 I use it every week to make baked eggs and it’s also a great salad dressing. Red Hot is actually compliant which totally surprised me. Personally, I don’t like it, but my husband does. I’ve made wings and pulled chicken covered in a mixture of the sauce and ghee and he loves it. Also, one of my most popular recipes- Buffalo Chicken Casserole– yum! Trader Joes Jalapeno Hot Sauce- THIS is MY favorite. I eat it on eggs every day and I never get sick of it. No added sugar or weird ingredients and only $2! Buy it! 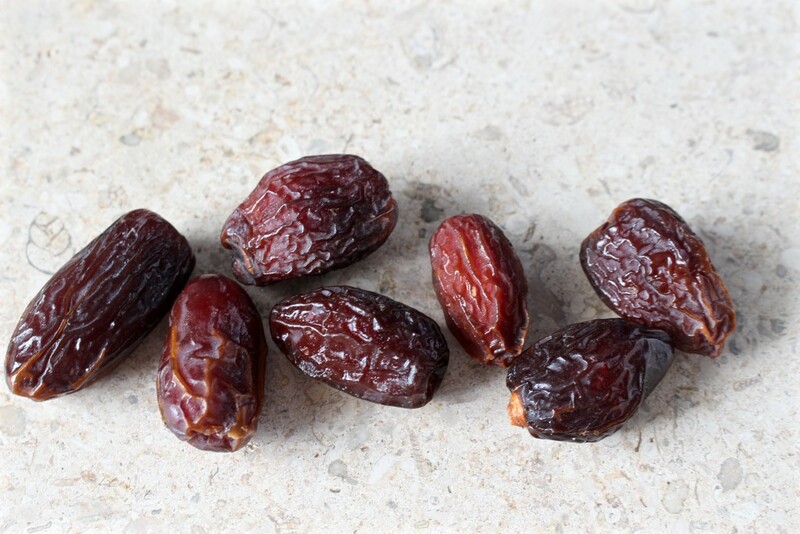 Dates– this is one the only approved sweeteners and it’s what I always use. I love them because they don’t have a strong flavor and they are loaded with health benefits. I use them in my Paleo Ketchup, Barbecue Sauce, Sweet and Sour Sauce, Chocolate Sea Salt RX Bars, Sunbutter RXBars, Pumpkin RXBars, and Apple Cinnamon RXBars. You can’t taste them, they just give a nice sweetness. HERE is how to make date paste if you’re interested. A couple other sweeteners that are approved but I never used are unsweetened apple sauce, figs, and 100% fruit juice. Sardines- these are so healthy (read labels for ones packed in olive oil) and my husband actually likes them. I’m grateful for that because sometimes he needs protein quick and these are easy. 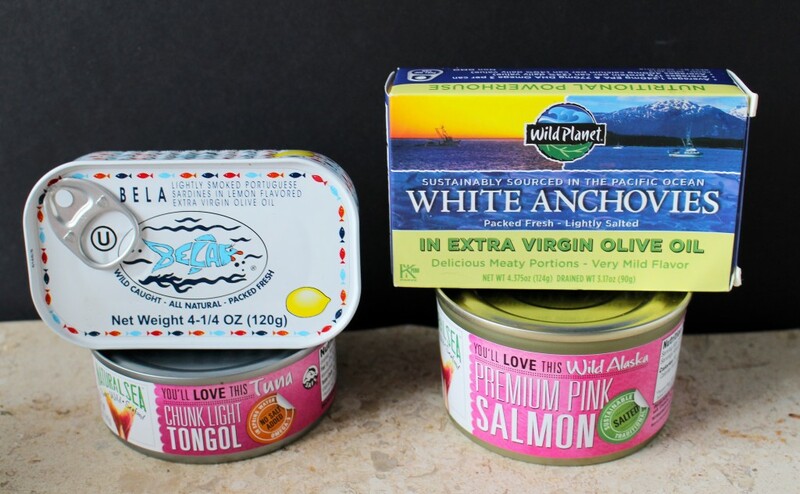 Tuna and Salmon- perfect for when you don’t feel like cooking. Mix with a little mayo and some chopped pickles- or whatever you like. Super quick and easy. My Tuna Salad is my go-to quick meal. Also, this Tuna Noodle Casserole is so so good (just leave off the chips)! Here is where I buy these. Almonds and almond butter– we always have these on hand. If I don’t make homemade almond butter then I buy it from Trader Joes because they have the best price. Cashews and cashew butter– My husband eats cashews as a snack every day and I eat the cashew butter with zucchini every day. Both are a little pricy but worth it. My Cashew Bars make a great savory snack! 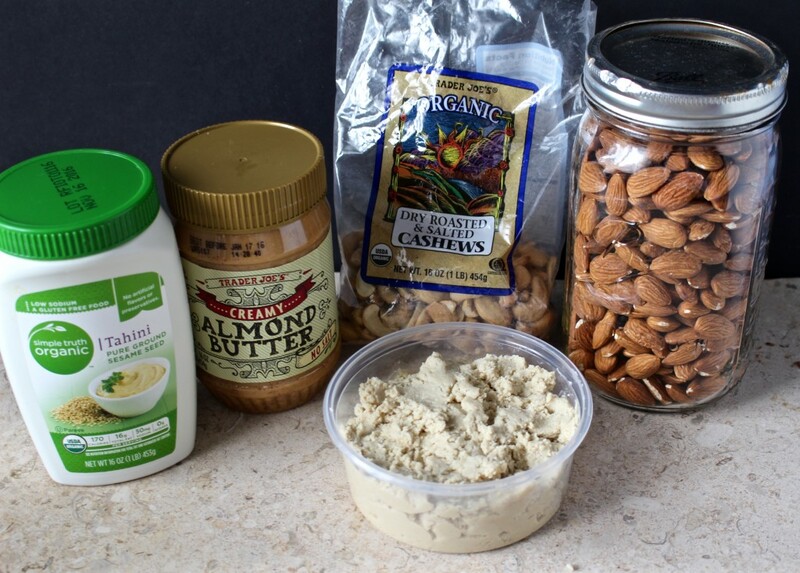 Tahini is great for making Paleo Hummus. Not pictured: sunflower seeds and butter, walnuts, pistachios, sesame seeds, chia seeds and pecans. These are not necessary, but are helpful. Remember: no baked treats!! I use them in savory dishes like Paleo Meatloaf, Paleo Baked Meatballs, Whole30 Teriyaki Meatballs, Whole30 Chicken Zucchini Meatballs and Whole30 Chicken Tenders and the tapioca is great for thickening sauces like in my Salisbury Steak and Orange Glazed Salmon. Cassava flour is not pictured, but also allowed. This may be the most important one! 🙂 Most likely you’re giving up cream, half and half, or milk in your coffee so now is not the time to go cheap! Buy good coffee!! Organic fair trade is the best. 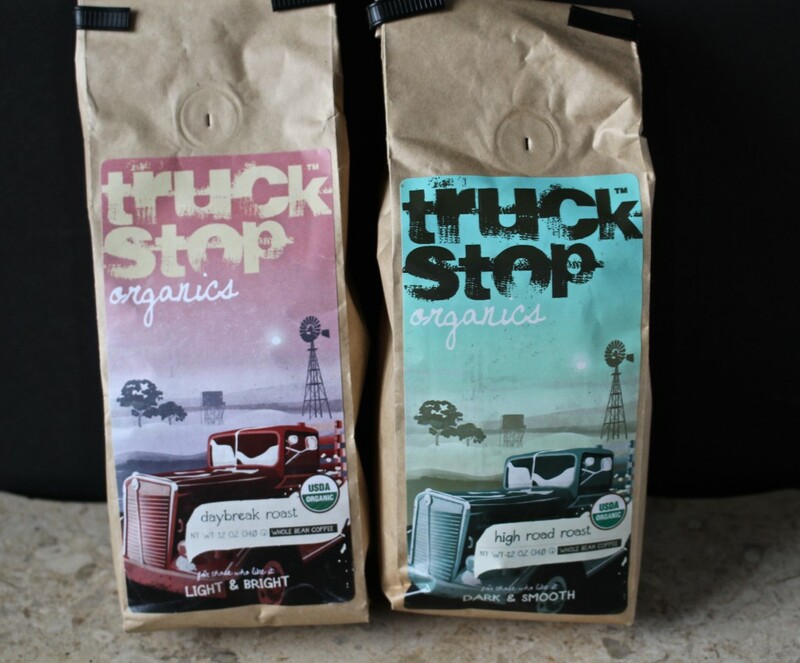 This Truck Stop is one of my favorites and very affordable. Whole Foods has a good inexpensive one and of course Trader Joe’s has a few options. These are some items that aren’t exactly necessary, but they add flavor which is always a good thing. Those 2 mustards are my husbands favorites. I’ll add them to some nitrate-free lunch meat for a quick lunch. My favorite way to use the Tessemae’s dressing is to cover chicken with it and bake it. I do that when I realize I have no food made and need to make something without thinking. You can find those at Whole Foods or even Kroger. Pickles and Peperoncini- these are good mixed in with tuna salad or eaten along side a meal. I didn’t realize how many companies use food dye and artificial ingredients in these two items. These two brands are good ones with minimal ingredients. Toasted Sesame Oil– this is great for asian stir-frys. I use it in my Paleo Chicken and Broccoli and Egg Roll in a Bowl. 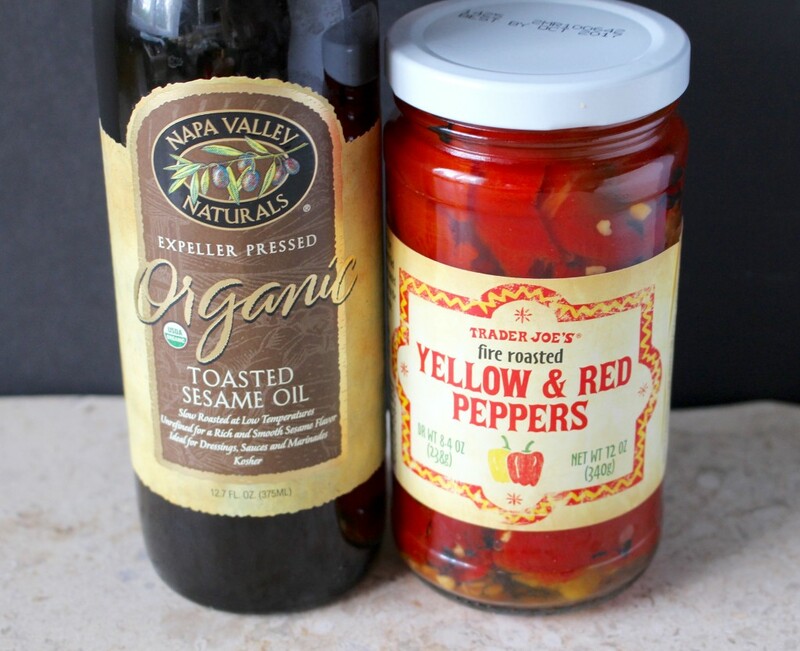 Roasted Red and Yellow Pepper- another item that has hidden sugars. This is a compliant one and is great in Paleo Hummus or Breakfast Pizza Quiche. I always have a couple jars on hand. You should still rely mostly on real perishable food, but these are some items that will make life easier. What are your favorite pantry items? Did I miss any? I hope this was helpful and good luck on your Whole30! You can do it! I’m spending a few months (yes, months) preparing for Whole30. We are a family of 6 (four picky young eaters, picky husband also!) and I’m nervous to try Whole30 because of all the pickiness 🙂 and the time it takes to prep. So, I’m test-driving all my recipes to make sure I like them and to make them more familiar when the time comes. We live nowhere near a TJ’s. For your items that are TJ brand, do you have a suggestion for a suitable substitute? We have Kroger, Aldi, and Whole Foods nearby, and Natural Grocers. I feel comfortable ordering as well, when needed. I usually just shop at Kroger because I don’t want to spend a ton of time driving all over the city for my ingredients. Thanks. Hi Hannah- I love that you’re preparing yourself! Sounds like your family will be ready when the time comes 🙂 Yes! All my Tj’s items can be found elsewhere. For the coconut cream- I’m finding that more in stores now next to the canned coconut milk. It’s usually in a smaller can. If you can’t find it then just buy full fat coconut milk and place it in the fridge. The top will thicken and that’s the cream. The ghee- I don’t even use that brand at all. I always use Thrive Market, Organic Valley, or Tin Star Foods. For the salsa- I know Kroger carries some compliant ones, you’ll just have to check the label. I can’t remember the brand. All the single seasonings should be found at Kroger. I think that’s all, let me know if there’s a product I forgot and I’ll let you know an alternative. Hope that helps! Do you have a cookbook with all the information in these articles? I love the pictures of items suggested. We are new to this diet and appreciate anything we can learn. Hi Oddlaug- I’m sorry I don’t. Maybe screen shot some of them so you can look at them while shopping?